La Conner is known for being a quaint town situated along the shore of the Swinomish Channel, which is a connecting waterway to the Puget Sound. The surrounding area is home to a renowned and diverse mix of artists, writers and other creative individuals. It is also known for its Swinomish Tribal Community, Shelter Bay residents, fishermen, farmers, loggers and other hard working individuals that keep our small town thriving. If you're searching for a relaxing getaway, then the La Conner Channel Lodge and Country Inn are the premier lodging destinations of choice. The town features many boutique shops, art galleries, antique shops, specialty stores, 3 museums, restaurants, and more. La Conner and the surrounding areas are wintering grounds for swans and Canadian geese and our fertile farmlands continue to seed crops and produce food, which is why our local dining experiences are like no other, especially when it comes to our fresh seafood. Enjoy fine wineries and breweries or get in touch with nature through wildlife activities, such as bird or whale watching. For more information about our incredible town, visit the La Conner Chamber website www.lovelaconner.com. See the sights! 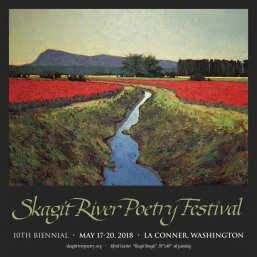 Take the Walking Tour of La Conner or Bike around Skagit Valley. Tourists flock from all parts of the globe to see our famed Tulips every April, but not as many know about this sunny blossom that pops up just a bit earlier. 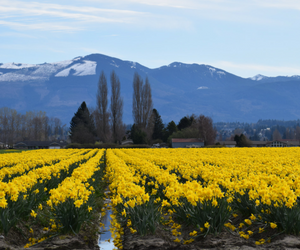 There is nothing quite as wonderful as entire fields of bright, cheery daffodils against our Mt. Baker backdrop. It’s arrestingly beautiful in March with the Daffodils blooming and the town of La Conner provides many events, excursions and more to celebrate. 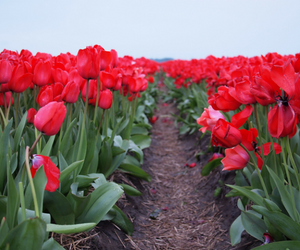 The Skagit Valley Tulip Festival is one of the destination events for the Pacific Northwest, held from April 1-30. Every spring hundreds of thousands of people come to enjoy the celebration of spring as millions of tulips burst into bloom. As with all things governed by Mother Nature, the tulips bloom according to their own schedule sometime during the festival. For tours visit Roads2Tulips.com. Our Mission is to support lifelong literacy and cultural diversity through the writing, reading, performing, and teaching of poetry in Northwest Washington schools and communities. 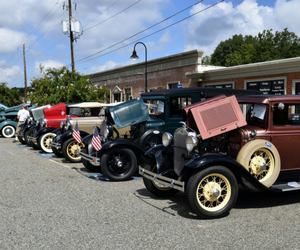 The La Conner Classic Boat and Car Show presents an opportunity to share our American heritage with you and your family on the first weekend of August. Whether your love is classic cars, show cars, classic yachts, or work boats, you’ll be surprised and delighted at this event.